You should know that I am no big fan of prefolds. I know a lot of people who love them, but I would rather use a flat, or pretty much any other kind of diaper out there. Then, my twitter feed started repeating the same message: Geffen Baby hemp prefolds are super absorbent and super soft. My curiosity was peaked. So... I went to order one, and chickened out. Three times. I ended up ordering a 10 pack of their hemp wipes. They are a fantastic deal at only $8.99 for the whole set. I was a little concerned because they are single layer instead of two, but it turns out not to matter. I take that back - It does matter, but only in that they are fantastic.The are durable enough to clean up the biggest messes, but thin enough to get into all the little nooks and crannies that babies have. The hemp fabric is super soft, which is a big issue for us with N's sensitive bottom. In fact, these wipes somehow remain soft even when line dried. I want clothes made out of this fabric. Seriously. A nursing cami, maybe? I can only imagine how fantastic their nursing pads are for new moms. At first, I was disappointed about the tag sewn on each wipe. I thought it would be annoying and get in the way, but I honestly never notice them anymore. These have sincerely taken their place as my new favorite cloth wipes. If I can justify the (admittedly small) cost, I'll have to order another set. While Geffen Baby is getting their new website up and running, you can still order their products from the Lovely Eco Chic, or from the store tab on the Geffen Baby Facebook page. *I was not paid or compensated in any way for this post. I just really love Geffen Baby. I've finally started using cloth wipes for each wet diaper. I think once G's stools are consistently solid I may use them for dirty diapers. For now I use disposable wipes for those. I use the diaper to wipe off most of the mess, the use the wipes to make she's really clean. That way I can use my diaper sprayer and not worry so much about the wipes. 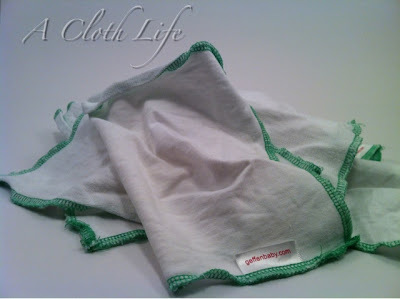 I've been using cloth wipes for a while, though, and only recently transitioned to not using disposables at all (including travel).